Hi Dolls! The 4th is four days away and I’m thinking cookouts, the beach, and evening fireworks. I’m not one to don holiday colors, with the exception of the 4th. I love to do a little Independence Day red, white and blue. Peep my picks below. If you’ve been following this blog for any length of time, you know my obsession with red lipstick. I tend to reach for matte reds, but in warmer months, I like to do a gloss. My choice for the 4th, Anastasia Beverly Hills Lip Gloss in Socialite. 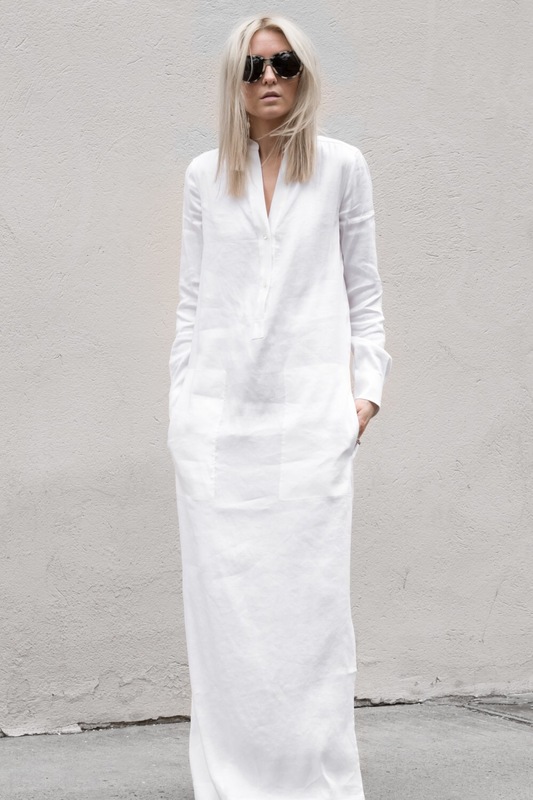 This crisp summer look was inspired by one of my uber stylish girlfriend’s, Shawna W. We were recently at luncheon and she had on a beautiful white linen maxi dress by Theory. 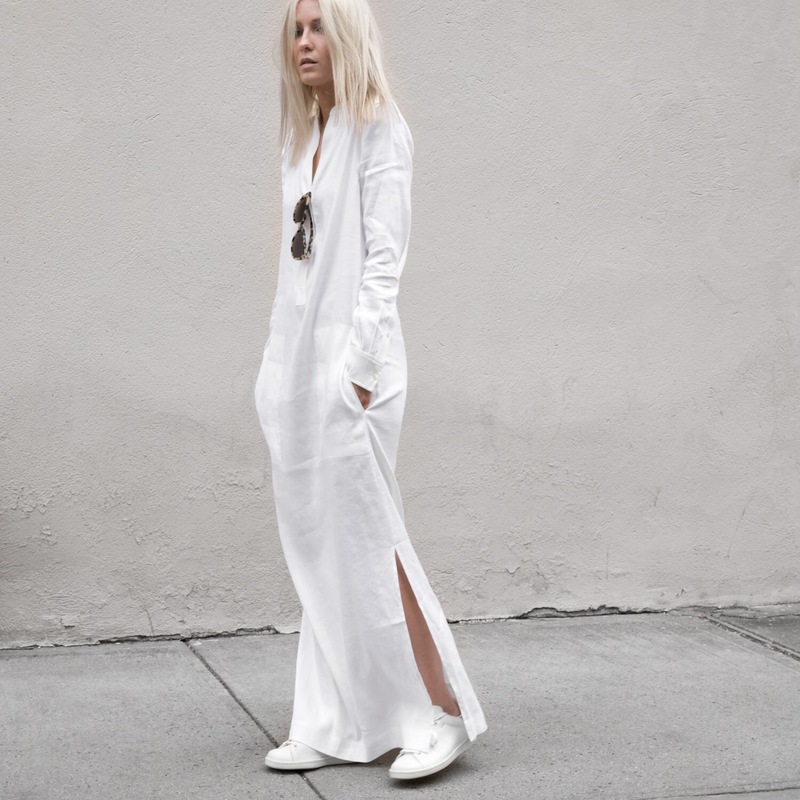 The look screams the 4th and can carry me from day to evening. 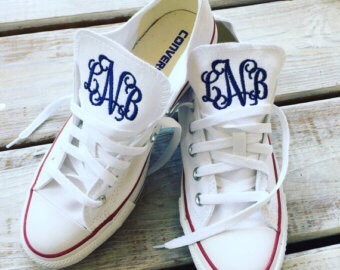 For a more casual look, how cute would it be to pair this dress with monogrammed white Chuck Taylor’s! Ok, I love a white manicure. 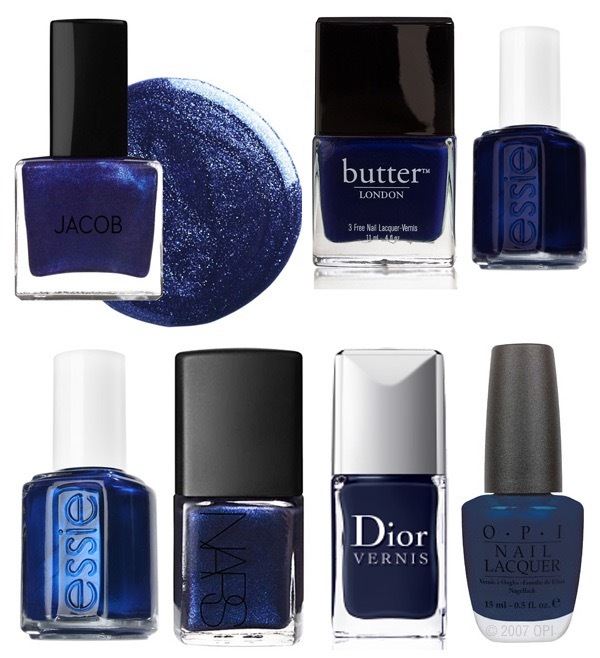 Any of these are perfect for a Fourth of July manicure. 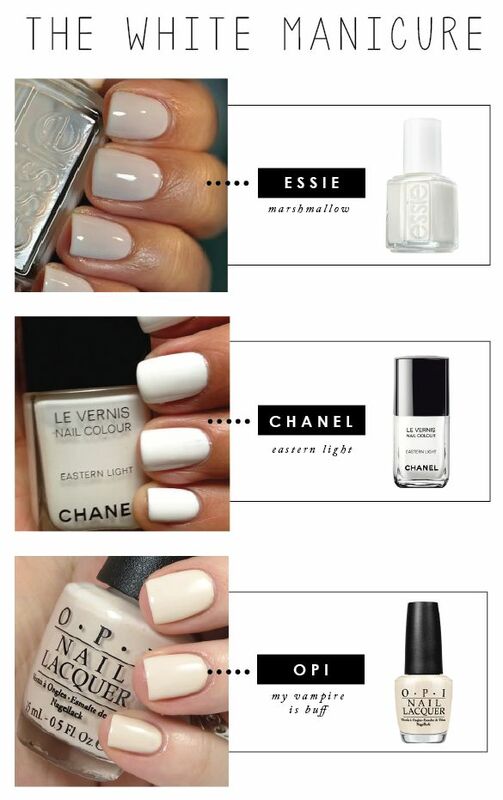 I’d also add Opi Funny Bunny, a creamy white staple. Part of the day will surely be spent poolside or on the beach. This calls for the perfect pedi. Why not do your take on flag blue. As you are more than aware, October is Breast Cancer Awareness Month. Many of us are raising money and participating in “Race for the Cure” events in support of our mothers, daughters, sisters, aunts, friends, and even ourselves. There are numerous ways to help raise awareness and funds in support of finding a cure for this insidious disease. Many businesses are donating proceeds raised from the sale of their products to the Susan G. Komen Breast Cancer Foundation, the National Breast Cancer Foundation, Inc., the Breast Cancer Research Foundation and others. Here are a few of my favorite products that support research and funding for breast cancer eradication, and to show you’re aware and that you care. What better way to show you care than by penning a note to a family member or friend battling breast cancer or celebrating survival. These fab “Fight Like a Girl” note cards from Effie’s Paper are sure to put a smile on any Doll’s face. 50% of the proceeds from the sale of each set of notecards will go to Girls Love Mail to support their MILE OF MAIL campaign. I fell in love with the Save Lids to Save Lives campaign several years ago. 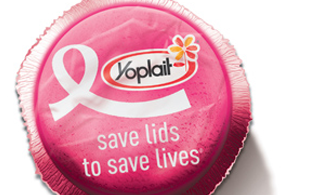 Beginning in September of each year, for each Yoplait Yogurt lid received and each code redeemed online by June 30, 2013, General Mills will donate 10 cents to the Susan G. Komen for the Cure. What an awesome and tasty idea! You should know however, that today’s post is more than just an arbitrary post recognizing another “theme month” on the calendar. It’s about saving lives. It’s also about honoring one of my favorite Dolls, Barbra (Barb). Barb was diagnosed with breast cancer in September 2011; and to put it simply she has been the picture of strength, grace, honesty and fabulousness through it all. Barb launch her blog, inkwellchicks, after being diagnosed to chronicle the story of her journey, and that of her über supportive best friend, as she confronted this disease. (They coined the names PinkInk and RedInk for themselves.) I’ve read every word of every post and always walk away inspired, and even more importantly educated. Some posts have been harder to read than others, and some had me LMBO! Barb has since launched another blog PinkwellChick, a broader advocacy site. Suprisingly, I only had one question for her ~ “What does Breast Cancer Awareness Month mean to you?” Why that question? “Theme months,” as I call them tend to become commercialized, but for the person walking through breast cancer, domestic violence, or child abuse, these are more than days on the calendar that roll around to be recognized once every 12 months. I told you she was FABULOUS! 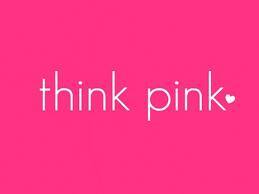 For more tips on breast cancer awareness and advocacy, follow Barb on Twitter at @pinkwellchick. All Hail the Sun Pt. Deux ~ Friday Quick Post Give Away! However, like our skin, the sun can also take its toll on our polish. Several years ago, I noticed that my polish would “yellow” during the summer months, turning a perfectly pretty manicure unsightly. 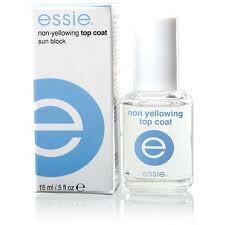 But, a trip to the local “beauty bar” and I found the perfect remedy ~ Essie Non-Yellowing Top Coat. This little bottle is a life saver! One coat and your polish will maintain its color for life your manicure. So, in celebration of fabulously-trendy manicures and pedicures this summer, today’s “Friday Quick Post” is a contest! The first three dolls who sign-up to follow “Pretty Domestic” via email will receive a bottle of Essie Non-Yellowing Top Coat. The contest doesn’t begin until 5:00 EST today, May 18th. NOTE: To follow, you have to confirm that you wish to receive posts from “Pretty Domestic” by clicking on the link you will receive in your email inbox. And don’t forget to follow Pretty Domestic on Twitter @1prettydomestic! Happy Following!